Leonardo DiCaprio has FINALLY won the Academy Award for Best Actor for his work in The Revenant, sixth time lucky as some people put it. Now, when you take something or somebody for granted, you do not value or appreciate something or somebody enough. You expect them to be always there for you and you don’t seem grateful for it. It’s a good phrase to learn. So, let’s practice together. 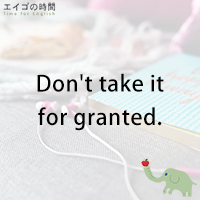 Please repeat after me: Don’t take it for granted. Next Post まったく同感。 – I couldn’t agree more.